As investors continue to move money out of mutual funds and into ETFs, and with more issuers creating a European ETF footprint, the time is right for asset managers to consider how ETFs can accelerate their distribution strategy. 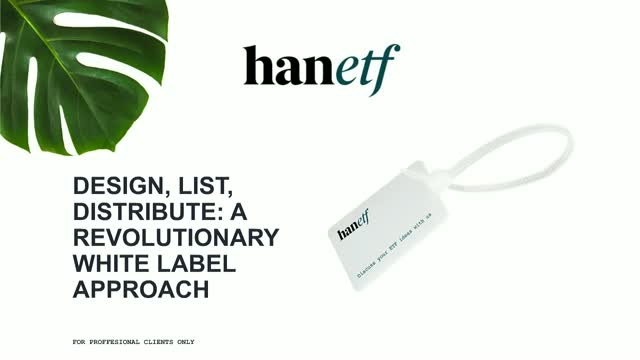 During this webinar, ETF industry pioneer and HANetf co-CEO Hector McNeil will explore the various options available to enter the market, and will dive into HANetf’s unique white-label solution. HANetf and guests uncover the transformation of the Kuwaiti economy and the opportunities for investors in this unique emerging market. Healthcare technologies are addressing many of the challenges faced by a ageing population; revolutionising diagnostics, treatments and care. There is a seismic shift occurring in the way we consume information and entertainment content. This change in consumer behavior is having a significant knock-on effect for advertisers as audiences are spending more time looking at their phones than TVs. With almost a third of the world active social media users, and with online advertising spending expected to reach $274 billion by 2020, we explore how social networks, such as Snapchat, Facebook and Weibo are benefiting from this huge advertising disruption. When examining investment opportunities in new or smaller ETFs, investors can get a misleading picture of liquidity by focusing on the wrong metrics. In this myth busting webinar, HANetf and RBC Capital Markets will look at the different ways of assessing ETF liquidity and show how ETF liquidity can be found when it is not visible 'on screen'. As the trade war with China rages on and emerging market equities enter a full bear market, do you know the best opportunities to capitalize on in 2019? HANetf and EMQQ Index will explore the improving fundamentals in the consumer growth story of emerging markets and identify a unique set of circumstances created for investors by the trade war. Is Amazon an ecommerce giant or cloud megastar? Is Facebook a tech company or communications platform? The recent move by The Global Industry Classification Standard (GICS) has hugely disrupted the technology sector classification. We look at how this move strengthens the case for using Theme-based products to access leading tech companies. The thirst for higher productivity and cost reduction means that businesses everywhere are embracing Industry 4.0. We take a look at what 2019 holds for themes such as the cloud, cybersecurity, social media and blockchain, and how these long-term themes and technologies that impact multiple sectors of the global economy, present ample opportunities to invest in tech. Cloud is the transformative technology of the modern world, changing the way we communicate, manage information and do business. With billions of internet-connected devices already in circulation, HANetf explores the growth drivers of cloud technology and shows how European investors can gain exposure to this generationally important theme. HANetf is joined by Anthony Ginsberg, Founder and MD of GinsGlobal Index Funds to look at the investment opportunity in emerging, world-changing technologies. HANetf is HANetf is Europe’s first independent white label ETF platform, providing an efficient, cost effective solution for asset managers and financial institutions seeking to issue UCITS ETFs in Europe. Presented by: Hector McNeil, Co-CEO, HANetf.